Revenue in the Furniture & Homeware segment amounts to US$32,265m in 2019. Revenue is expected to show an annual growth rate (CAGR 2019-2023) of 9.6%, resulting in a market volume of US$46,570m by 2023. User penetration is 13.9% in 2019 and is expected to hit 19.8% by 2023. The average revenue per user (ARPU) currently amounts to US$274.35. In global comparison, most revenue is generated in China (US$78,728m in 2019). The eCommerce market segment Furniture & Homeware includes the online sale of furniture, kitchen and household goods such as kitchen and bathroom accessories, textile furnishings, lamps, decoration, candles, pottery and china. Electronic household appliances are not included in this market segment. Important providers in this market segment are the online shops wayfair.com or ikea.com. All monetary figures refer to the annual gross revenue and do not factor in shipping costs. Reading Support Revenue in the Furniture & Homeware segment amounts to US$32,265m in 2019. Reading Support The Furniture & Homeware segment is expected to show a revenue growth of 12.9% in 2020. 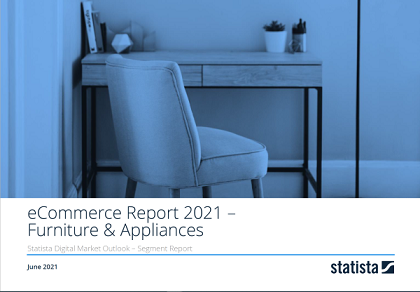 Reading Support In the Furniture & Homeware segment, the number of users is expected to amount to 167.4m by 2023. Reading Support User penetration in the Furniture & Homeware segment is at 13.9% in 2019. Reading Support The average revenue per user (ARPU) in the Furniture & Homeware segment amounts to US$274.35 in 2019. Reading Support In the year 2017 a share of 28.9% of users is 25-34 years old. Reading Support In the year 2017 a share of 56.4% of users is female. Reading Support In the year 2017 a share of 40.9% of users is in the high income group. Reading Support With a market volume of US$78,728m in 2019, most revenue is generated in China. Reading Support With a rate of 25.7%, the user penetration in the Furniture & Homeware segment is highest in United Kingdom. Here you can find more studies and statistics about "Furniture & Homeware".